I sent the link to several Canadian friends, not realizing it was "restricted". Just chatting about with a friend, and found myself thinking how weird it would be to go back and show it to myself in 1978, after I had seen THE MOVIE for the 20th time, or so. The notion that I'd one day be hired to "fix" Superman would be stunning enough, but that a clip from that movie would be used to illustrate an interview... WoW!! It's nice to have your thoughts and anecdotes of the subject in one place JB. And yes a superb job from SYFY split screening that scene while you described it! Well, finally we see a piece that captures what it is like to talk with JB in person - in particular, JB’s quick sense of humor. Your humor is organic to a conversation and not forced, and it really comes out here. We already know you can tell a story on the page, but you are a natural storyteller in real life as well. It’s really great to see your impact on Superman acknowledged and celebrated during this anniversary. I liked the short piece that was done with Walt Simonson, but it felt like a trailer to a longer feature that I wanted to see. What makes this longer piece so satisfying is its deeper dive into JB’s inspiration and interpretation of the character. Along with a good sense of humor about the subject, I really like that we hear about the frustration that was felt in creating the book. JB, your candor is appreciated as I think people really do not talk enough about the difficulties that some of our favorite books experience before they get to the reader. With all the challenges you faced, I’m glad you hung in there and made some fantastic stories. Kudos to the producers for showing actual comic book pages. I feel some of the network comic book docs are overproduced and don’t let us see enough of the artwork. It was really great to hear JB talk about “Metropolis - 900 Mi” and see the pages. Points off for showing other people’s artwork, which considering the amount of source material was totally unnecessary. I like the host - he seems knowledgeable and enthusiastic about comic books. As always, it's very interesting to hear your thoughts on comics, thanks for agreeing to the interview... more please! There are a lot of graying Superman fans who seem unable or unwilling to accept the fact that I did not storm in off the street, demand I be given Superman, kick over the apple cart and then walk away. Hopefully this interview will help to penetrate the miasma around their minds. I never understood fans who said that. That's a hell of a lot of clout, storming in off the street and doing that. The editor-in-chief/publisher must have been having an off-day to allow that! A very enjoyable and informative interview, JB. Thanks for doing it! incomprehensible to me. I was done with the character. Your writing and art made Superman my favorite character. Hey, what gives? The Internet says this John Byrne guy is a stark-raving-mad, angry, egotistical lunatic... but this guy is warm, funny, pleasant and self-effacing. It must be a Fake News conspiracy! He comes to my house, and THIS is how he says THANKS! is up on Facebook on the `Byrne Victims` page. Fantastic interview. Still learning a lot years later. It's nice to know our host's own immigration experiences had a bearing on MOS. 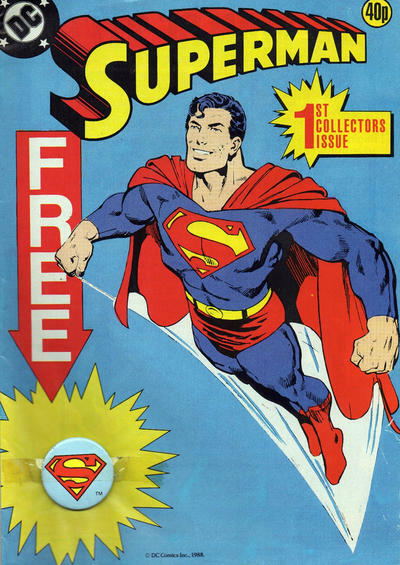 MOS was reprinted in the UK in SUPERMAN, a fortnightly title that eventually became monthly. This was around 1988 (I had read the US issues in '86). I bought that issue. And yes that sellotape was murder to deal with. I enjoyed the original US issues, but when London Editions Magazines (who held the DC licence at one point) published the MOS reprints, I thought I'd gone to Heaven: MOS, and later Mr Byrne tales, in A4 and on glossy paper?!!! Yay! as a callback to Phillip Wylie’s GLADIATOR? I appreciate the response. Thanks! I'm no fan of glossy paper, but what is "A4"? A4 is the U.K. equivalent of your letter sized paper. Although it is slightly longer and slightly thinner in portrait orientation. Finally managed to see this via the link Bill mentions. Loved it. A lot you had mentioned here before but it was still great hearing you speak those stories. Speaker of Stories! My new Native American name! Perhaps this interview will help to convince some people that a) I have neither a British nor Canadian accent, and b) I don't sound like the Wicked Witch of the West! And, no surprise I suppose, but this has generated a flurry of "Since you're doing interviews again..." requests. Well, no, sorry, I'm not.